Clockwork Wars is a fast-paced wargame for 2-4 players (5 if you purchase the Sentience expansion). Prior to every game, you will generate a unique map out of dozens of hexagonal tiles; these tiles represent forests, lakes, citadels, towns, factories, shrines, sorcerer's towers, barren wastelands, and capital cities. You will then choose 1 of 4 races to play; each race comes with a Unique Unit that possesses special abilities unavailable to the other players. You will also randomly choose a discovery tree of 9 discoveries in 3 different research disciplines: sorcery, science, and religion. Over the course of the game, you will be able to research these discoveries to upgrade your race and acquire powerful abilities. Since there are 45 different discoveries included in the base game, there is a massive degree of replayability here. Due to the modular map, different races, and variable tech tree, every game of Clockwork Wars will play out differently. Your goal in Clockwork Wars is to acquire the most Victory Points (VP's) through 7 turns of play. VP's are primarily earned by controlling natural resources: lake and forest hexes. However, they can also be earned through use of powerful discoveries (such as the Analytical Engine, or Colossus) and through careful use of espionage. Each turn is divided into several phases: Spymaster, Recruitment, Deployment, Combat, and Research. Turns 2, 4, and 7 also have an additional Scoring Phase. During most phases, players are making their decisions and taking their actions simultaneously, so that there is virtually no down-time in Clockwork Wars. The meat of the game is recruitment and deployment. You will recruit workers through control of your capital, as well as villages and cities on the map. You can then deploy these workers onto the map to expand your holdings and engage in warfare. All deployment decisions are made secretly and simultaneously, using an innovative deployment-order system. Players reveal their orders at the same time, place armies upon the board, and then resolve battles. Combat is simple and deterministic. No dice are rolled, and each battle is resolved in seconds. Reinforcement orders, espionage cards, and discoveries add important strategic layers to these otherwise straightforward combat encounters. After combat, players gain Influence Points (IP's) for research territories that they control: shrines, manufactories, and towers. These IP's can then be spent on discoveries in religion, science, and sorcery. Some discoveries include: Gunpowder, Dirigibles, Druidism, Dragonflame, and Secret Societies. You can also spend your IP's on the all-powerful Generals - uber-units that have the capacity to turn the tides of war. Researching powerful discoveries before your opponents is often the route to victory in Clockwork Wars. Clockwork Wars is of moderate complexity, with a rules explanation taking around 20 minutes. A complete 4-player game takes 90-120 minutes, and 2-player games can be finished in under an hour. For a game with such strategic depth and epic scope, it plays very quickly - so much so that you'll typically want to play two games back-to-back! 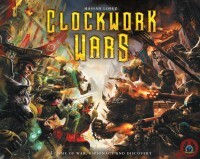 Add a Review for "Clockwork Wars"